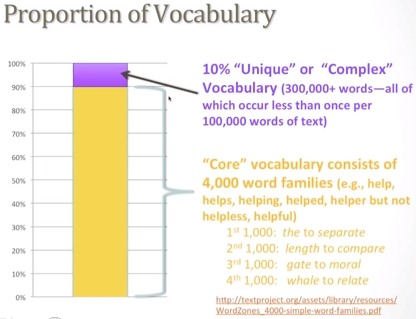 Dr. Freddy Hiebert, in a video webinar posted here, explains the importance of vocabulary in determining the complexity of text. Hiebert notes that ten percent of the words in text are considered complex with text, used to inform, having a higher proportion of these words. At the end of the 17-minute video, Hiebert describes a free resource, replete with 34 lessons, that any educator can download and begin using in their classroom. The resource, Exceptional Expressions, can be found at the website www.textproject.org. This entry was posted in Academic Vocabulary, text complexity and tagged academic vocabulary, CCSS, Common Core, free resource, Hiebert, lesson, Shift 6. Bookmark the permalink.